Sales Territory | MetroMed, Inc.
MetroMed’s sales force is highly trained and clinically educated to act as the direct sales force for medical product manufacturing companies which do not have a direct sales force of their own. MetroMed works closely with both hospital and home healthcare companies to determine how our vendors and products can benefit your organization. 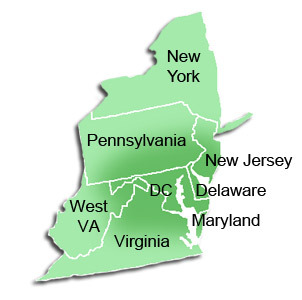 MetroMed has covered Metropolitan New York, all of New Jersey, Pennsylvania, Delaware, Maryland, Virginia and D.C. since its inception. Feel free to contact our sales professionals at the phone number or email listed below.